You should copy this picture and enlarge to full page. *Designer used clear Solo® cups. Add each ingredient in order listed to plastic cup. 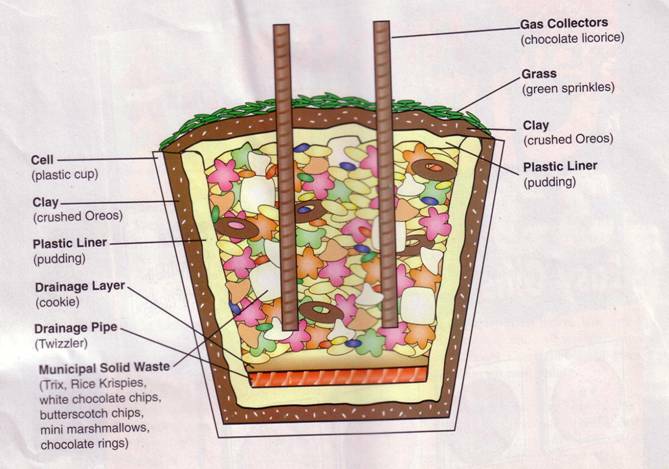 The layers of a landfill are described below. Layer 1 (cell): Landfills range in size from four to six acres of land. The area, or cell, must be free of debris and able to hold the weight of the landfill mass. This is represented by the plastic cup. Layer 2: This layer is three feet of clay which prevent fluids from seeping out of the landfill. This is represented by pressing 1 tsp. of Oreo cookie crumbs firmly into bottom of cup. Layer 3: This layer is a thin liner of plastic which is designed to prevent leaks in the ground beneath the landfill. This is represented by adding 2 tsp. of pudding. Layer 4: These are pipes that make the leachate collection system. They collect leachate which is a liquid that is squeezed out of the garbage leachate then travels to a treatment pond. This is represented by laying two Twizzlers across pudding. Municipal solid waste is all of the garbage from peoples' homes and businesses. · Organic waste (Trix) is yard waste and food scraps. · Paper (Rice Krispies) consists of cardboard, newspaper, and, packaging products. · Plastics (white chocolate chips) include milk and soda bottles and food containers. · Glass (butterscotch chips) range from bottles to old building windows. · Metals (mini marshmallows) include tin and aluminum cans and appliances or sheet metal. · Tires (chocolate rings) include those from cars and trucks. · Other garbage (mini M&M's) contains old toys, shoes, and clothing. This is represented by adding 1 tsp. Trix, 2 tsp. Rice Krispies, 1 tsp. white chocolate chips, l tsp. butterscotch chips, six mini marshmallows, four chocolate rings, and 1 tsp. mini M&M's. Spread evenly. Layer 7: This layer is the leachate that forms. It seeps through all of the layers to the pipes which filter the liquid out of the landfill. This is represented by squirting chocolate syrup around the edge of the cup. This outermost layer prevents rainwater from entering the landfill and keeps gases from leaving and polluting our air. Layer 8: This layer is the top plastic barrier that seals the landfill. This is represented by adding 2 tsp. of pudding. Layer 9: This layer is five to seven feet of soil. This is represented by sprinkling 1 tsp. of Oreo cookie crumbs onto pudding. Layer 10: This layer is grass which prevents soil erosion. This is represented by adding 1 tsp. of green sprinkles. Gas collectors. These pipes are placed in the closed cell and act as methane gas collectors. They prevent fires by collecting the gas produced from decaying trash. This is represented by inserting two chocolate licorice pieces vertically into the cup. The Solo cups she uses are 9 or 10 oz ones with hard plastic side. Very wide at the top. Mix milk and pudding and combine with margarine mixture. Mix well, and then add Cool Whip. Thoroughly clean out a new plastic flowerpot with soap and hot water. Have Oreo's on both the bottom and top layers. This cake looks especially good if you add gummy worms for special effect. Score the edges (about three cuts per slice). Boil or microwave until the slices curl like wiggly worms. For an extra-icky touch, add a few squiggles of colored ketchup. Let ice cream sit at room temperature until lit is easy to scoop. Spoon ice cream into glasses until it is about halfway full. Pour or squeeze about 3 tablespoons chocolate syrup into each glass. Slowly fill almost to the top with club soda and stir well with a spoon. Serve with a straw and tall spoon for excavating those luscious brown lumps. Gross serving suggestion! To make this slop especially disgusting, plop an unwrapped tootsie roll into each glass, the boys just love it! With high fire danger, small children and serious hunger NOW, These dogs are ready when you are. Before leaving home, place fully cooked hot dogs in one or more wide mouthed 1-2 gallon sized thermal jugs (24 dogs will fit in 1 gallon). Pour enough boiling water to fill the jugs. By the time you need them, the dogs will be steaming hot. Bring tongs to lift out the hot dogs, as well as all the usual hot dog condiments. Push 1/2 a red grape onto tooth pick half for the head. Score down the back to create wings. on the back of the ladybug.